Winter in Rochester, MI brings so much fun to 15 month old Socrates. When snow came down last weekend, Socrates had so much on the snow. Socrates was playing fetch as well as flying over snow covered trail. What a way to celebrate Thanksgiving in Michigan! I hope you had a great thanksgiving day with your love ones. I hope we can also meet Jasmine when she moves to California. Socrates also spends his winter in Southern California to get away from cold gray Michigan winter. but he sure loves his time in Michigan too. We live in Clarkston, MI and had a snowfall of 15.3". 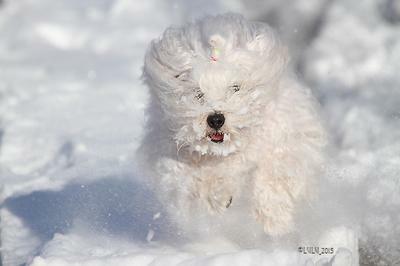 Of course Jasmine had to run out into it and the snow was over her head. 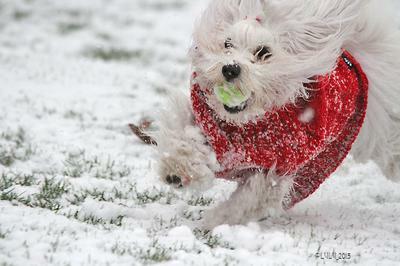 But she leaped through the snow and had a ball. We are moving to California cause I am done with snow and cold. Even my cat was to in it. Crazy animals!!! 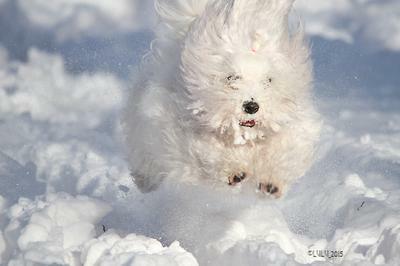 You look so cute running and having a great time in the snow. Great action photos and wishing you a wonderful Thanksgiving. You are adorable and thanks for posting. Great pics. 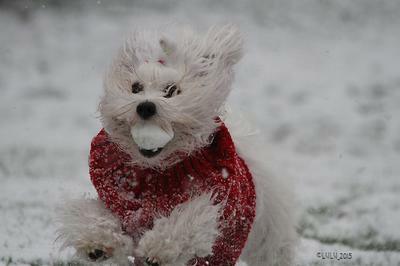 Simply adorable playing in the snow.